To help achieve a safer more stronger platform we build a self supporting sub-frame above your existing joists using internal walls and purling's to strengthen the boarded area. Our timber framed 200mm self supporting sub-frame does not rely upon your existing ceiling joist unlike other companies who use inferior battening or 3x2 laid directly on to your existing ceiling joists which will weaken them. Yes, depending on the height required to build the sub-frame storage floor above any cables, light fittings, pipes or loft insulation we use either a timber 200mm raised double self supporting sub-frame, which is mainly for houses 50+ years with a purling style roof or for more modern properties (Within the last 50 years) with a truss styled roof we use a 270mm raised LoftZone store floor system this raises the new storage floor to a more suitable level to avoid loft insulation compression especially in new build properties with government recommended insulations levels. New build properties are completely different to older purling style roofs house such as Pre-war terraced and detached. Timber self supporting sub-frames are required in these houses to add support and strength so as not to rely upon the exiting ceiling joists so a much safe stronger area can be gained. Sub-frames are basically a supporting frame under the boarding to allow the boarded area to be raised or for adding better support and strength. 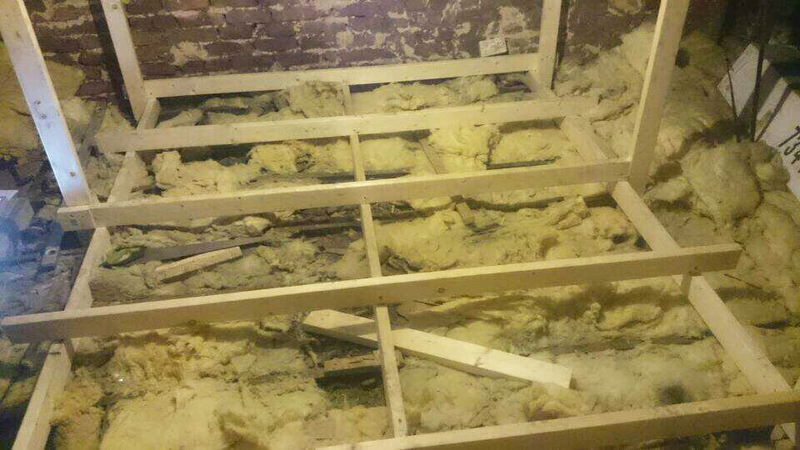 Any houses that have any insulation protruding above the joists will require a sub-frame before boarding. You must allow your insulation and loft to breathe. Stopping air circulation in lofts by boarding all of your loft or blocking eaves, roof or soffit vents can caused problems like condensation build up. 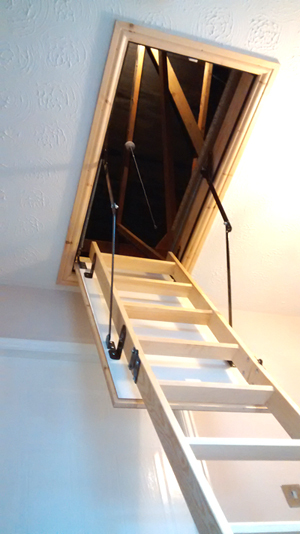 Using a unique system of steel joists and supports we can create a extra strong and safe professionally raised floor for storage in your loft without the need for major work. 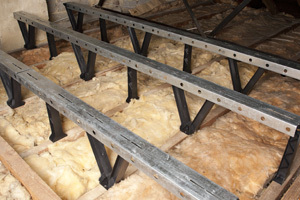 We can give you an additional height of 270mm above your loft insulation to sit neatly and correctly without compression in between your joists. A standard sub-frame constructed of wood is ideal for any property that may not have the correct roof height required for a StoreFloor system (above) or lofts in garages that do not required any or little raising. This sort of sub-frame is best suited for new build properties in the last 50 years or so with a trussed roof. We can span timber across to gain any particular height above the insulation level and is ideal if you don't have allot of roof height. Supported Sub-Frame For Older Houses With Weaker Ceilings? We come across allot of weaker ceilings or ceilings with smaller joists than normal and we advise not to just board or batten and board (as some companies call it) because the ceiling joists are to weak to allow the additional boarding & storage weight (load). Mainly older terraced and detached houses pre WW2 and post WW2 when we started building again we had a short supply of materials so houses were built to a very minimal specification. Although your ceiling joists are adequate (in most cases) to support your ceiling only they were never designed to take any extra weight on them so they must be strengthened or built above correctly to allow boarding, storage items and you to walk about safely and by adding more support this will prevent problems in the future. Insufficient strengthening or supporting of a storage floor will cause problems with weaker ceilings and unfortunately allot of "loft companies" out there are not aware how to create strong safe storage sub-frames (storage platforms) in a loft. There is more to it than you think, see the picture below? this shows the extra work that goes in to creating a level self supporting storage platform. The sub-frame is hung in places where it cannot bear down on your existing joists for support, usually above the central area of a bedroom, near the light where there is no additional support. Hangers must be fitted to the purling's to help support and suspend the sub-frame in most cases as this is required before any boarding can be installed. Cutting corners to falsely reduce quotes for loft boarding is common place in this industry but this mean using inadequate materials so this will not conform to any regulations. We will not cut corners just to falsely reduce costs like others do. It is recommend (but optional) to get a load calculation done for your loft storage requirements before you have loft storage installed. But even without this the extra strengthening is recommended and would be silly to ignore as anyone can see adding more weight to a ceiling will require better and in most cases independent support. Newer built properties however (with a truss roof in the past 50 years or so) are a little different as they have support from a web truss frame that is installed in your loft every 600mm and supports the roof and ceiling all in one. 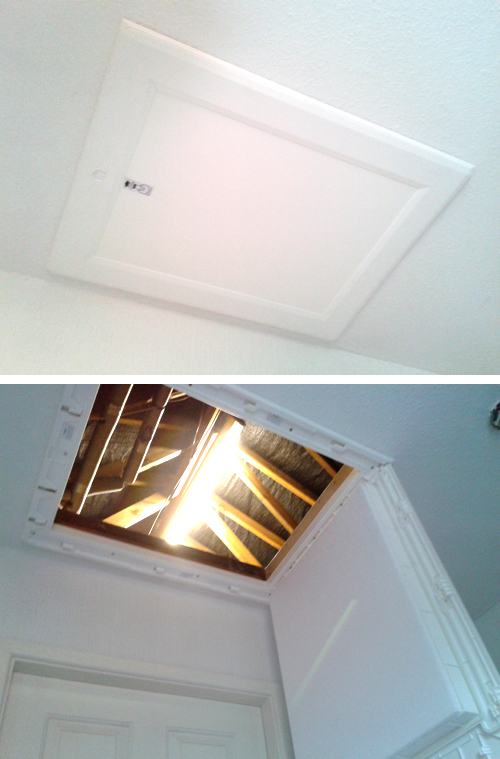 So our LoftZone raised loft floor system can be installed directly to this type of ceiling to gain height above the insulation of 270mm so you can create a storage area without removing or squashing any insulation. It is bad practice to remove or squash installation down to board your loft for storage and this is why your new build developer or builder don't like to recommend using your loft for storage because of the cowboys doing this from the past. Loft Opening Not Big Enough ? Old Inefficient Wood Loft Off Hatch ? 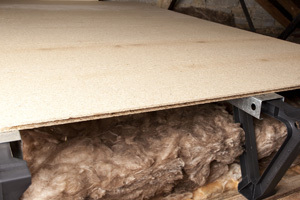 As part of our loft boarding packages we do loft insulation from as little as £5.06 a square metre for 100mm and £8.90 a square metre for 200mm supplied and installed. 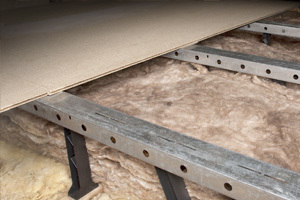 There are now specialist products that allow you to create a raise loft storage floor consisting of sturdy tri and uni support 270mm legs which support a metal cross beam section that allows you to board on to without compromising your insulation. We can install a simple light bulb and pull switch so you can immediately switch in the light before stepping off your ladder, no point having a switch further inside where you cant see to switch it on. We have a choice of standard bulbs the new LED bulbs or fluorescent tubes fittings. The choice is your, the cost is not to great between them and it really depends on how much area is boarded in your loft. Fluorescent tube lighting is our most popular because it has a very high Lumens rating and spreads the light much further than a standard bulb.